On Tuesday, 7 June, I made my longest cross-country flight to date: Manassas Regional (HEF) to Hampton Roads Executive (PVG), a 133 nautical mile trip each way. That is admittedly not a very long journey by airplane, but I'm content to take one baby step at a time. My brother and two-year-old nephew/godson were there to meet me when I landed. The flight out was uneventful. By the time I took off, the mist had burned off. The summer haze provided 7-8 sm visibility aloft--not great, but definitely VFR. I planned the flight to take me right over top of William and Mary so that I could take a few pictures of the campus from 3,500 feet. Next time I will fly a couple of miles to either side, because it is really tough to get pictures from straight ahead or straight down in a Cessna 172. Lesson learned. At about 10 miles from the field, I began a gentle descent. I knew there were some really tall towers just outside the traffic pattern, but I didn't realize how hard they were to see in the haze. Norfolk Approach even called to warn me about them, which I appreciated. I was happy with my landing on runway 28 after not flying a Cessna 172 in almost a month. I stupidly shut off the engine perpendicular to the tie-down spot. One of the airport staff saw me struggling to get the airplane turned without a tow bar and immediately came to help. Another lesson learned. My godson got a kick out of sitting in the airplane and pretending to fly. 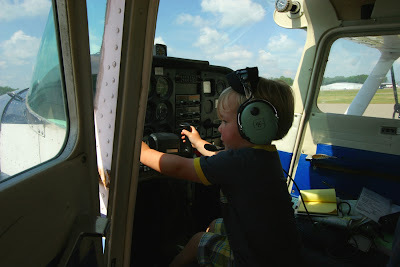 I strapped him into the right seat and taxied the 250 feet to the self-serve fuel pumps. I could tell that he wasn't completely sure what was happening when the engine was running, but he wasn't outwardly scared. Maybe after a few years and a few hundred more hours of experience I'll be able to convince his Mom to let me take him flying. There was a slight threat of thunderstorms during the return trip, as there is every summer afternoon on the east coast. Nasty storm cells had developed out in the Shenandoah valley, way off to the northwest. I looked at the weather and filed my SFRA flight plan using DUAT. After preflighting the airplane, I decided to call FSS for a final weather check. The briefer was all gloom-and-doom: chance of cumulonimbus around Dulles and precipitation along the route. The ceilings were 5,000+ feet, so I wasn't too concerned about inadvertent IMC, but the briefer's tone made me second-guess my decision to launch. I'm a new pilot and I don't have any experience dodging thunderbumpers. I know that I want to be no closer than 20 miles to a thunderstorm, but I didn't have the luxury of XM weather or anything like that on board. I was navigating with a combination of pilotage/dead reckoning, VOR/DME, and my 12-year-old Garmin 12CX handheld GPS which has an annoying tendency to lose lock on the satellites and only knows the waypoints that I manually load into it. Planning course diversions is still a one-handed struggle in turbulence--though it is getting a little bit easier each time--and there is no shortage of airspace to potentially bust in the Washington DC area if I managed to lose situational awareness. I decided to call an experienced pilot friend of mine for a sanity check. He concurred with my decision to launch. He told me that the relatively high ceilings would certainly allow me to see any isolated thunderstorms and I'd be able to steer well around them. He said that Potomac approach would most likely warn me, too, since I would be taking advantage of flight following. In the worst case, I had plenty of fuel to turn-tail and divert to Richmond or any of the airports around there. The weather gave me no trouble on the return trip. I didn't see any CBs and there was no precipitation: just haze, muck, and a cirrus overcast from Williamsburg onward. Quantico Arrival warned me that the MOA that I was about to fly through was hot, so I immediately turned west and then headed to HWY before entering the SFRA. As usual, Quantico dumped me rather than handing me off to Potomac Approach, but it was really no big deal. There was a 7-8 knot crosswind at Manassas. I was reasonably happy with the landing. It was barely mains-first in a good sideslip--I needed to get the pitch attitude a little bit higher before touchdown.